Roche based in Switzerland, beat expectations of the market for its net income during the first half of the year with help from sales of a cancer drug along with a big one-off gain in its pension plan. Core earnings a share, adjusted for special items, rose by 7% to over 7.74 Swiss francs or $7.86, while analysts were expecting an average of 7.53 francs. The company made an accounting adjustment that was one-off to its long-term pension plan, which helped to increase earnings by over 426 million francs. However, that will be offset in time as it expects pensioners to have longer lives and the returns on investments for the pension to stay depressed due to low rates of interest. An analyst with Deutsche Bank said that by eliminating the pension effect, the results were in line with most expectations. Roche shares fell 0.2%, which was just better than a decline of 0.5% in the Stoxx Europe 600 Healthcare Index. Swiss-based Roche is the biggest maker in the world of cancer drugs. It confirmed its target for sales growth that is currency adjusted of the low to mid single digit range percentage wise for 2016. In addition, it expects it’s per share core earnings to be ahead of growth of sales. Novartis, a big rival of Roche announced on Tuesday that its profit could decline in 2016 due to ramping up its spending in marketing for Entresto its new drug for heart failure following a slower than expected start for the medication. 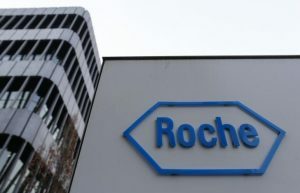 Sales of three major, well established medicines for cancer from Roche – Avastin, Rituxan and Herceptin with annual sale of each of over 6 billion francs continue to increase but Roche must push another promising drug as its sales of the ageing bestsellers are thought to have hit their plateau and expected to decline during the upcoming years. Roche CEO Severin Schwan said the company during a period of 12 months would be launching five new medications, which is an unprecedented number for new launches in the history of the company for such a short frame of time. The CEO said in June that he was becoming more confident that the pharmaceutical giant would continue to increase its sales and its profit even as copies at cut rate prices of the older cancer drugs of the company start to take away business beginning in 2017.